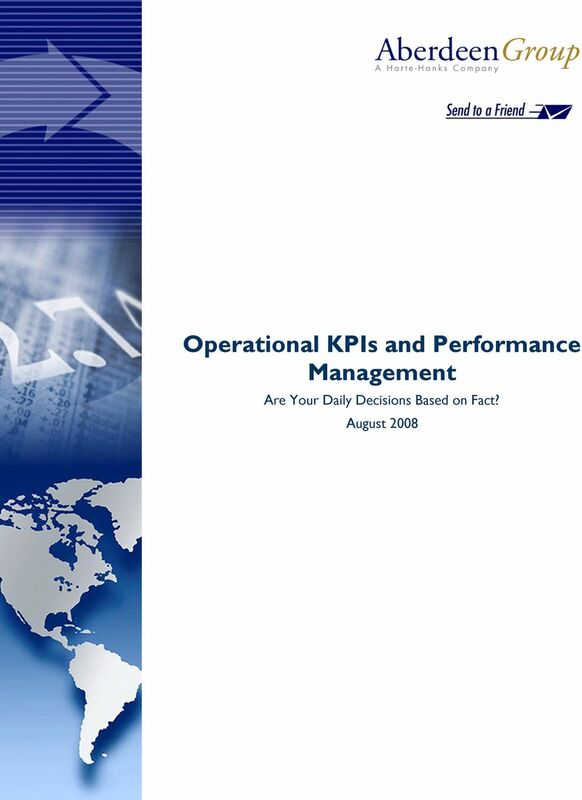 Download "Operational KPIs and Performance Management"
7 Page 7 Operational performance is rapidly becoming a top priority of business intelligence and performance management projects. Aberdeen research and respondent interviews revealed that activity and projects are focused on the desire to improve customer service, expense management, and sales operations performance. While this reflects the business areas most concerned, executives are struggling to gain visibility into the operational performance driving the business. 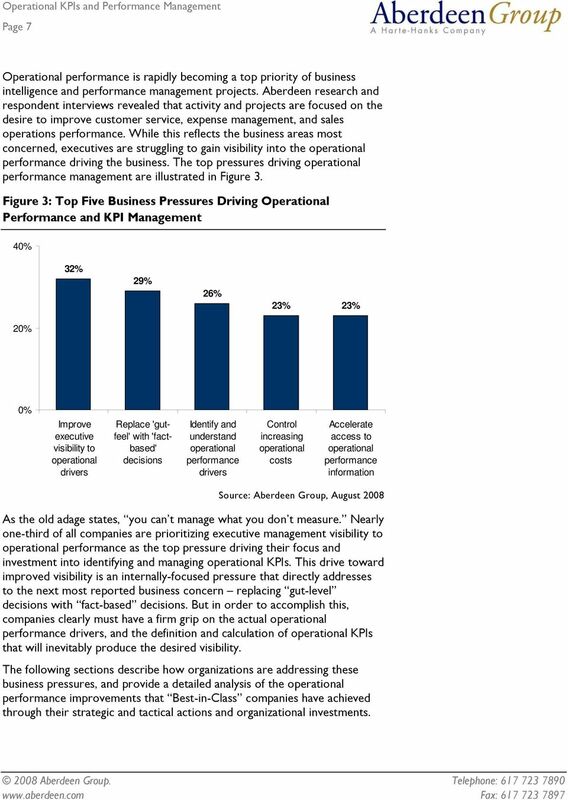 The top pressures driving operational performance management are illustrated in Figure 3. 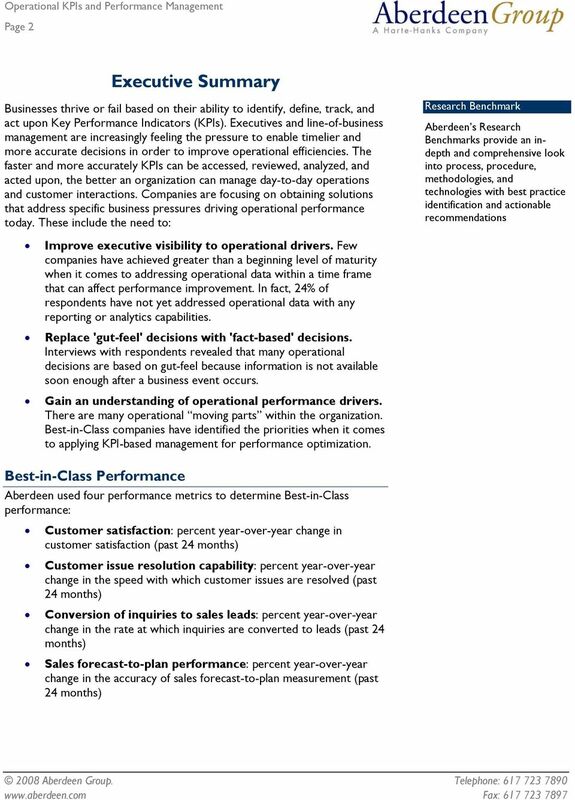 Figure 3: Top Five Business Pressures Driving Operational Performance and KPI Management 40% 32% 29% 26% 23% 23% 20% 0% Improve executive visibility to operational drivers Replace 'gutfeel' with 'factbased' decisions Identify and understand operational performance drivers Control increasing operational costs Accelerate access to operational performance information As the old adage states, you can t manage what you don t measure. 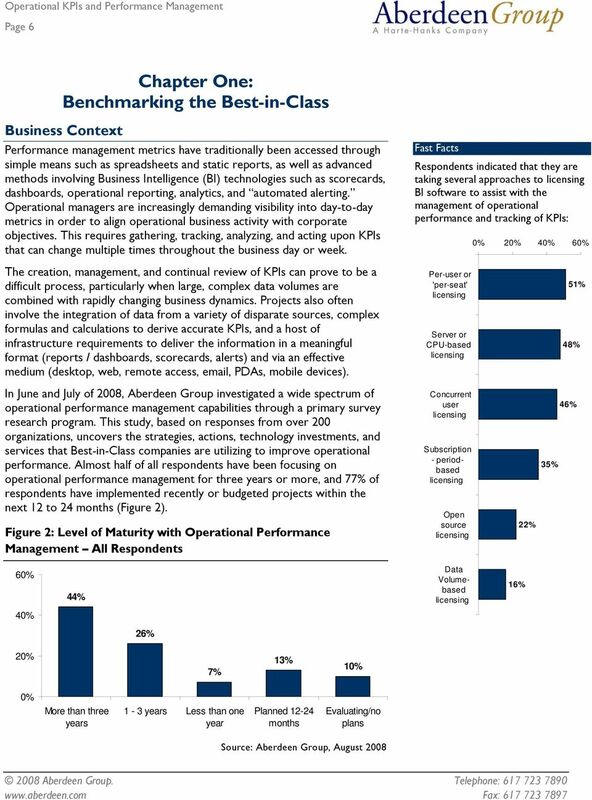 Nearly one-third of all companies are prioritizing executive management visibility to operational performance as the top pressure driving their focus and investment into identifying and managing operational KPIs. This drive toward improved visibility is an internally-focused pressure that directly addresses to the next most reported business concern replacing gut-level decisions with fact-based decisions. But in order to accomplish this, companies clearly must have a firm grip on the actual operational performance drivers, and the definition and calculation of operational KPIs that will inevitably produce the desired visibility. 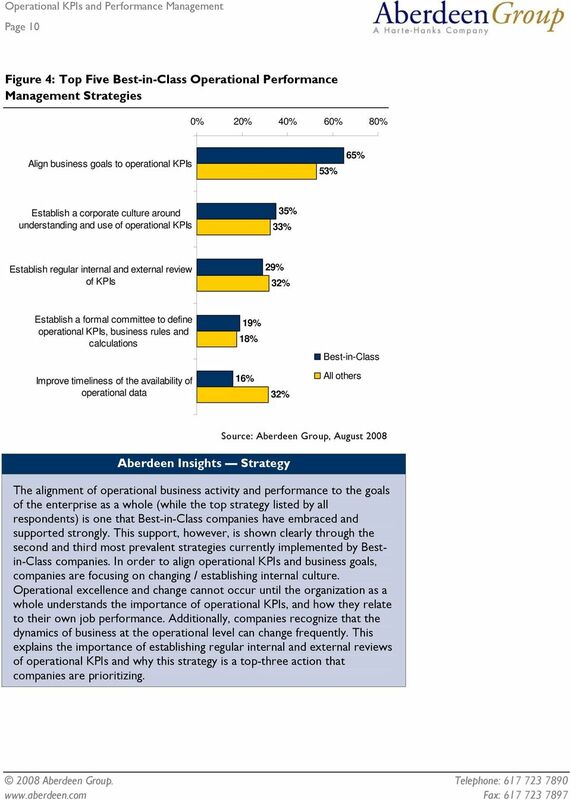 The following sections describe how organizations are addressing these business pressures, and provide a detailed analysis of the operational performance improvements that Best-in-Class companies have achieved through their strategic and tactical actions and organizational investments. 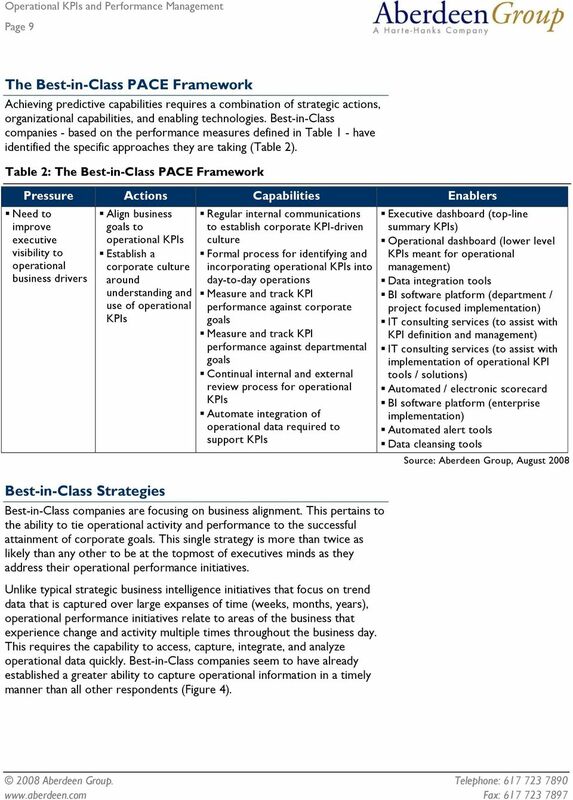 10 Page 10 Figure 4: Top Five Best-in-Class Operational Performance Management Strategies 0% 20% 40% 60% 80% Align business goals to operational KPIs 53% 65% Establish a corporate culture around understanding and use of operational KPIs 35% 33% Establish regular internal and external review of KPIs 29% 32% Establish a formal committee to define operational KPIs, business rules and calculations 19% 18% Best-in-Class Improve timeliness of the availability of operational data 16% 32% All others Aberdeen Insights Strategy The alignment of operational business activity and performance to the goals of the enterprise as a whole (while the top strategy listed by all respondents) is one that Best-in-Class companies have embraced and supported strongly. This support, however, is shown clearly through the second and third most prevalent strategies currently implemented by Bestin-Class companies. In order to align operational KPIs and business goals, companies are focusing on changing / establishing internal culture. Operational excellence and change cannot occur until the organization as a whole understands the importance of operational KPIs, and how they relate to their own job performance. Additionally, companies recognize that the dynamics of business at the operational level can change frequently. This explains the importance of establishing regular internal and external reviews of operational KPIs and why this strategy is a top-three action that companies are prioritizing. 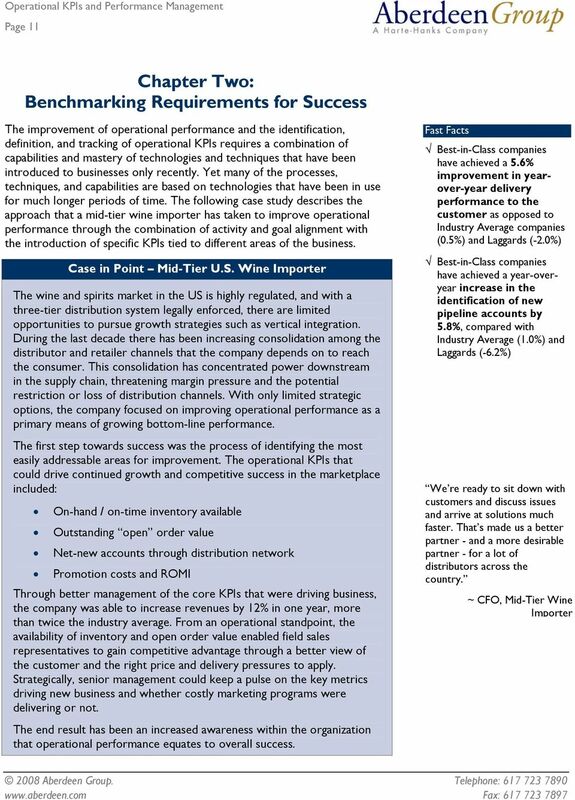 13 Page 13 Capabilities and Enablers Based on the findings of the Competitive Framework and interviews with end users, Aberdeen s analysis of the Best-in-Class demonstrates that successful operational performance and KPI initiatives depend on a combination of specific capabilities and technology enablers. Aberdeen's research has identified several capabilities that Best-in-Class companies share in order to achieve operational performance excellence. 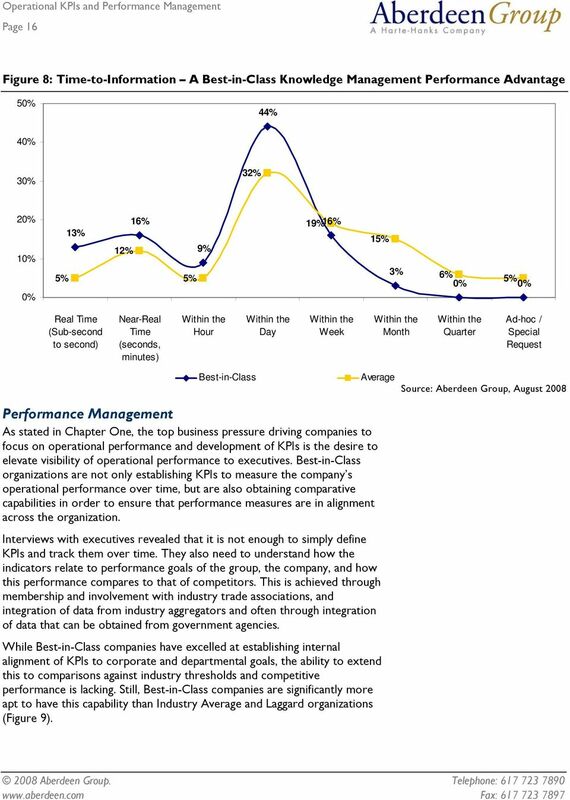 Process Aberdeen research has found that, as business dynamics change, so too must the KPIs that are used to measure performance. 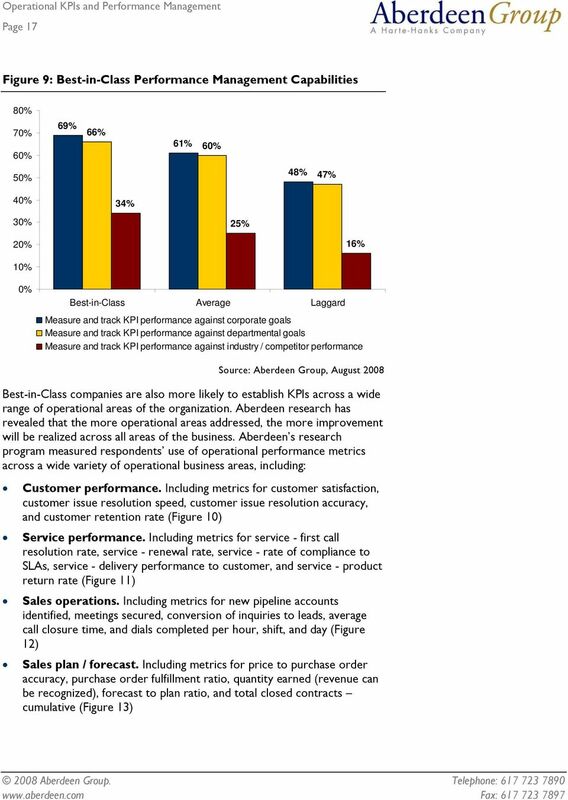 Best-in-Class companies are over 50% more likely than Industry Average companies and 100% more likely than Laggards to employ a method for identifying, incorporating and reviewing / updating KPIs related to operational performance (Figure 5). 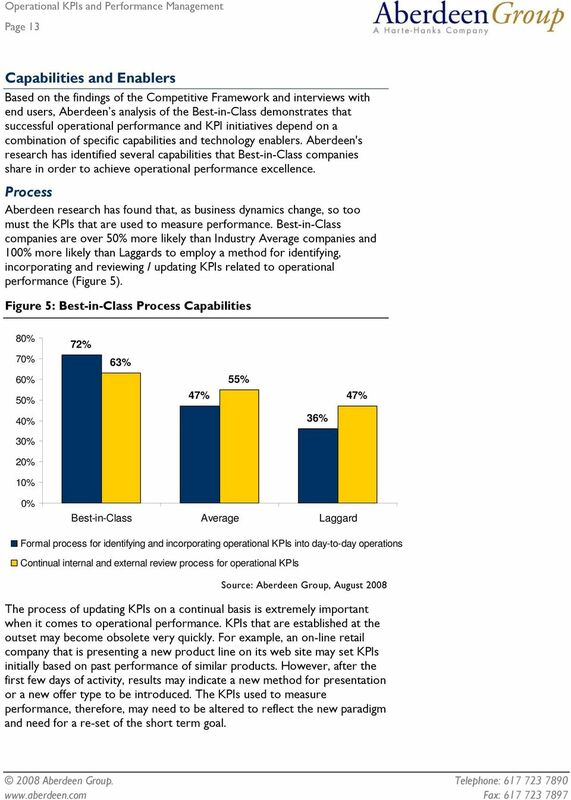 Figure 5: Best-in-Class Process Capabilities 80% 70% 72% 63% 60% 50% 47% 55% 47% 40% 36% 30% 20% 10% 0% Best-in-Class Average Laggard Formal process for identifying and incorporating operational KPIs into day-to-day operations Continual internal and external review process for operational KPIs The process of updating KPIs on a continual basis is extremely important when it comes to operational performance. KPIs that are established at the outset may become obsolete very quickly. For example, an on-line retail company that is presenting a new product line on its web site may set KPIs initially based on past performance of similar products. However, after the first few days of activity, results may indicate a new method for presentation or a new offer type to be introduced. The KPIs used to measure performance, therefore, may need to be altered to reflect the new paradigm and need for a re-set of the short term goal. 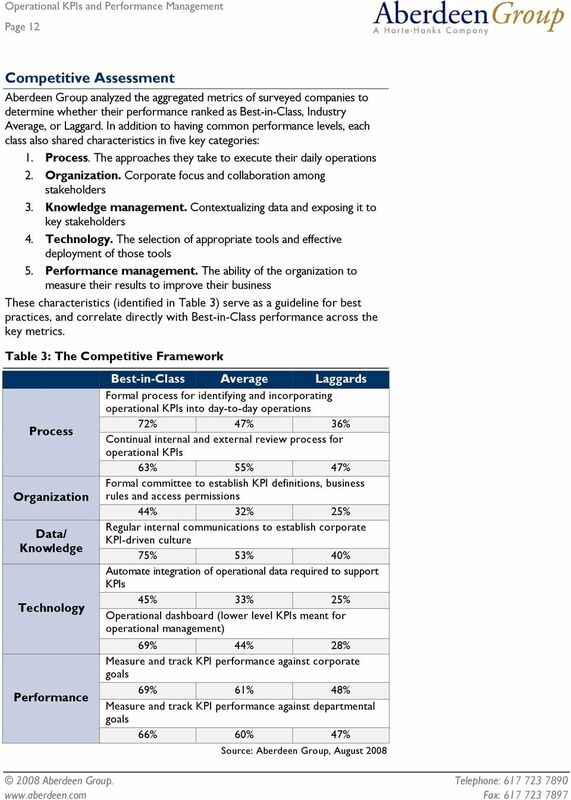 14 Page 14 Organization In addition to having a process for updating KPIs related to operational performance, Best-in-Class companies are also formalizing this process within the construct of a committee tasked with defining the KPIs (Figure 6). 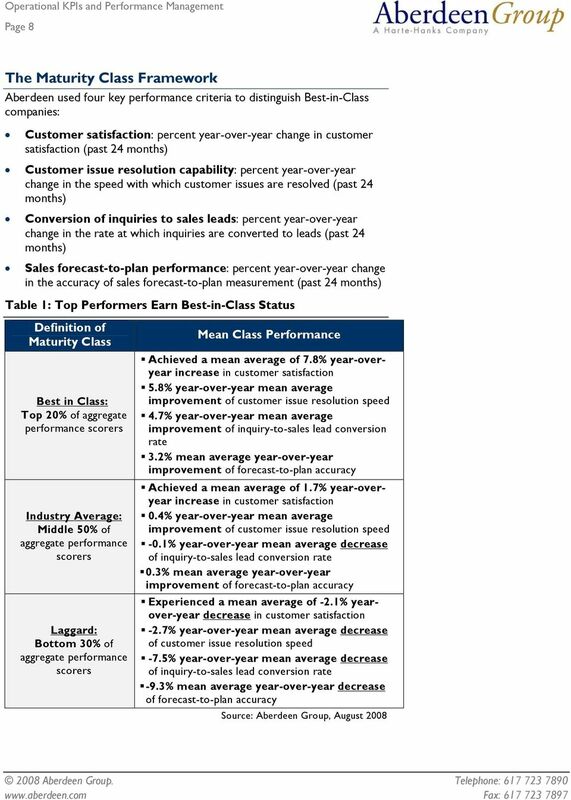 Best-in-Class companies are nearly 40% more likely than Industry Average companies and nearly 50% more likely than Laggards to take this approach. 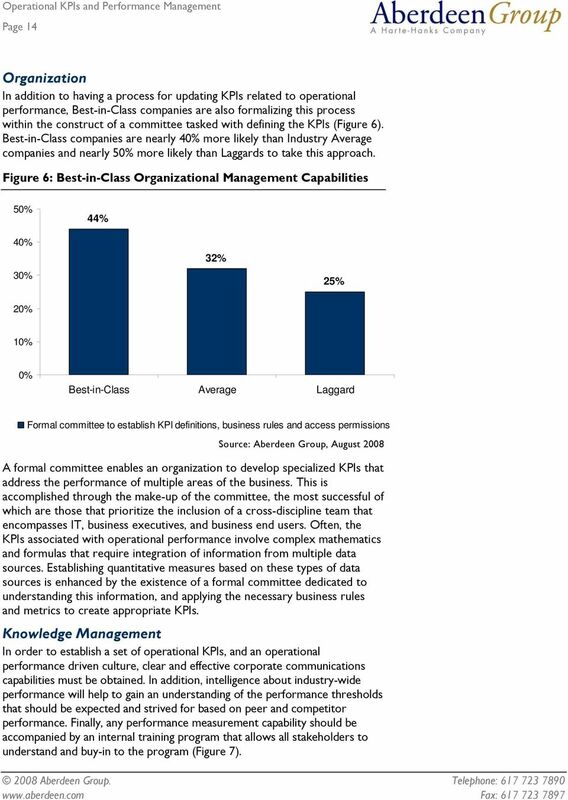 Figure 6: Best-in-Class Organizational Management Capabilities 50% 44% 40% 30% 32% 25% 20% 10% 0% Best-in-Class Average Laggard Formal committee to establish KPI definitions, business rules and access permissions A formal committee enables an organization to develop specialized KPIs that address the performance of multiple areas of the business. This is accomplished through the make-up of the committee, the most successful of which are those that prioritize the inclusion of a cross-discipline team that encompasses IT, business executives, and business end users. Often, the KPIs associated with operational performance involve complex mathematics and formulas that require integration of information from multiple data sources. Establishing quantitative measures based on these types of data sources is enhanced by the existence of a formal committee dedicated to understanding this information, and applying the necessary business rules and metrics to create appropriate KPIs. Knowledge Management In order to establish a set of operational KPIs, and an operational performance driven culture, clear and effective corporate communications capabilities must be obtained. In addition, intelligence about industry-wide performance will help to gain an understanding of the performance thresholds that should be expected and strived for based on peer and competitor performance. Finally, any performance measurement capability should be accompanied by an internal training program that allows all stakeholders to understand and buy-in to the program (Figure 7). 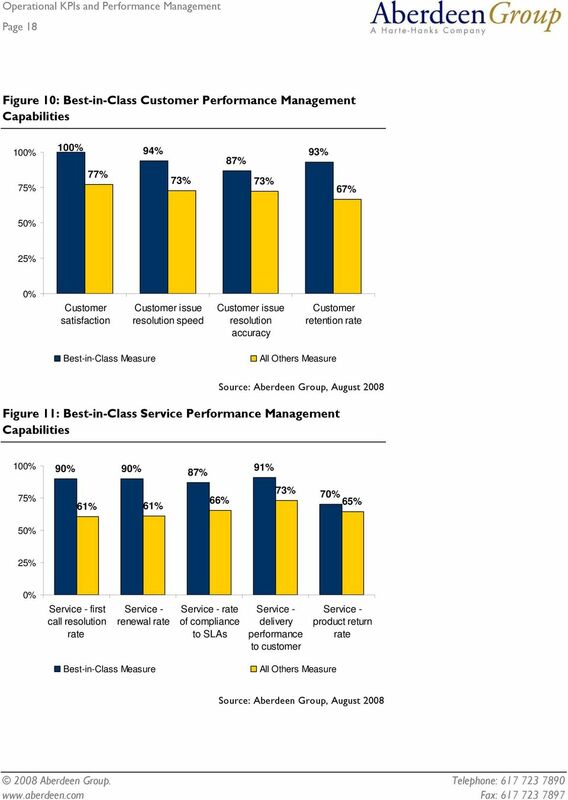 15 Page 15 Figure 7: Best-in-Class Knowledge Management Capabilities 0% 20% 40% 60% 80% 75% Best-in-Class Average Laggard 19% 20% 24% 24% 31% 36% 40% 53% Regular internal communications Membership in industry association or consortium Formal training program We measure performance against our peers through involvement in an industry consortium. This allows us to initiate improvement projects that are driven based on industry best-practices. Peerbased performance measures are important to achieving success. ~Senior Manager, IT, Large Utility Company Companies are trying to improve efficiencies and performance of many dayto-day and real-time operational activities, such as customer interactions, finance and accounting processes, transportation / shipping, sales activity, manufacturing, inventory management, and marketing. Aberdeen research conducted for the September 2007 report, Smart Decisions: The Role of Key Performance Indicators, found that Best-in-Class companies are improving their time-to-information through the implementation of capabilities, technologies, and services that enable faster delivery of mission-critical information to the people who need it, when they need it, and how they need it. Aberdeen has found that in the duration of a year, the gap has widened significantly in terms of the time-to-information capabilities that Best-in- Class companies have achieved. In fact, Best-in-Class respondents are now over 65% more likely to obtain information about business events within a day or less as compared to Industry Average companies (Figure 8). 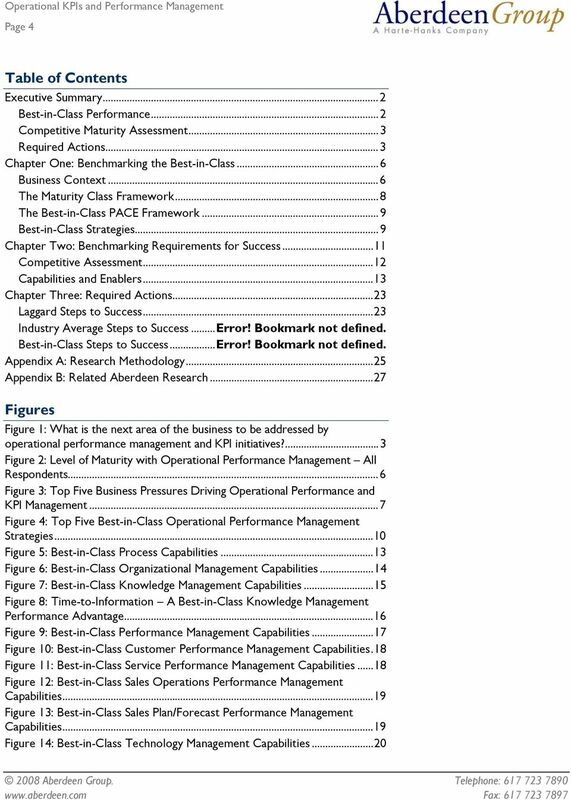 16 Page 16 Figure 8: Time-to-Information A Best-in-Class Knowledge Management Performance Advantage 50% 44% 40% 30% 32% 20% 10% 0% 5% 13% 12% 16% 5% 9% 19% 16% 15% 3% 6% 5% 0% 0% Real Time (Sub-second to second) Near-Real Time (seconds, minutes) Within the Hour Within the Day Within the Week Within the Month Within the Quarter Ad-hoc / Special Request Best-in-Class Average Performance Management As stated in Chapter One, the top business pressure driving companies to focus on operational performance and development of KPIs is the desire to elevate visibility of operational performance to executives. Best-in-Class organizations are not only establishing KPIs to measure the company s operational performance over time, but are also obtaining comparative capabilities in order to ensure that performance measures are in alignment across the organization. Interviews with executives revealed that it is not enough to simply define KPIs and track them over time. They also need to understand how the indicators relate to performance goals of the group, the company, and how this performance compares to that of competitors. This is achieved through membership and involvement with industry trade associations, and integration of data from industry aggregators and often through integration of data that can be obtained from government agencies. While Best-in-Class companies have excelled at establishing internal alignment of KPIs to corporate and departmental goals, the ability to extend this to comparisons against industry thresholds and competitive performance is lacking. 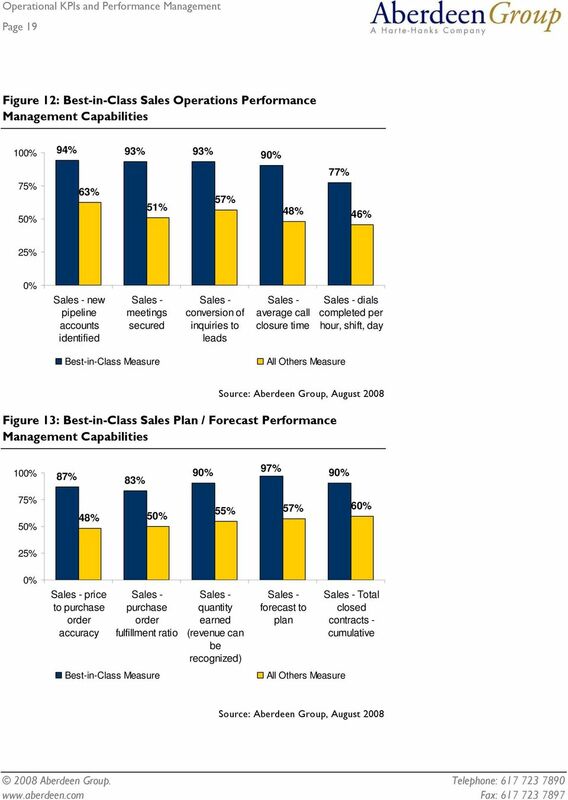 Still, Best-in-Class companies are significantly more apt to have this capability than Industry Average and Laggard organizations (Figure 9). 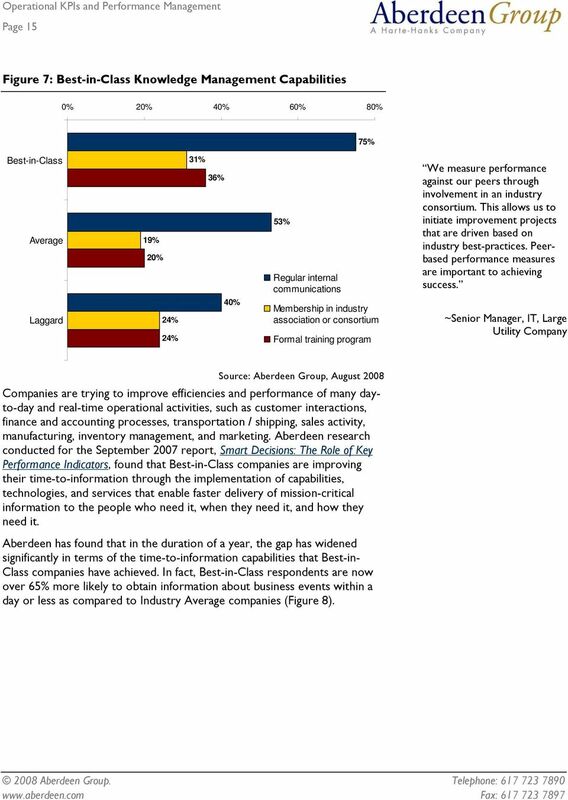 20 Page 20 Technology Interviews with respondents and survey results revealed that the time, effort, and IT resources required to generate operational reports and analytic capabilities and deliver them to the right end users at the right time is a major factor that inhibits operational performance improvement. This can come as an unwelcome surprise as BI implementations begin to grow in scope from pilot projects to full-production applications encompassing large data sets, complex calculations and algorithms, and a diverse set of nontechnical business users. The level of technical ability among users typically pushes the job of report generation to the IT department. This not only causes additional costs in terms of IT resource utilization, but also drives the need for additional headcount to be hired to meet the demand for increasing report and analytical view requests. 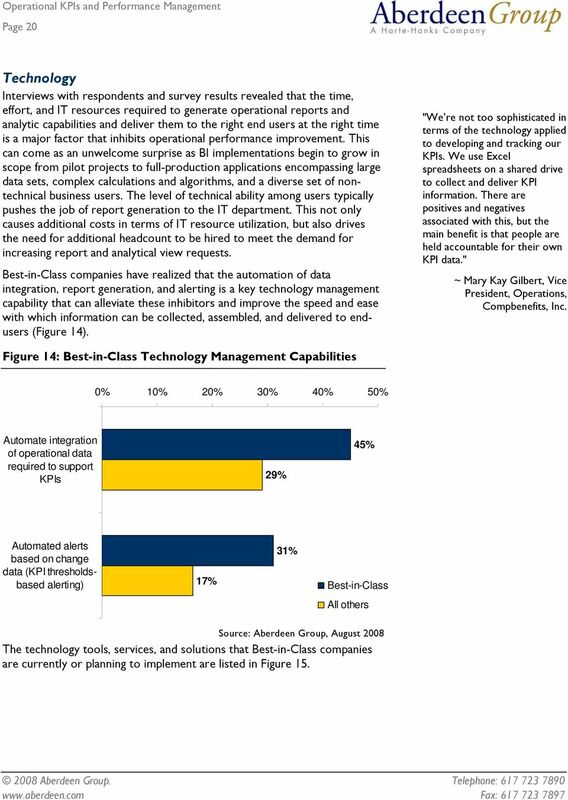 Best-in-Class companies have realized that the automation of data integration, report generation, and alerting is a key technology management capability that can alleviate these inhibitors and improve the speed and ease with which information can be collected, assembled, and delivered to endusers (Figure 14). "We re not too sophisticated in terms of the technology applied to developing and tracking our KPIs. We use Excel spreadsheets on a shared drive to collect and deliver KPI information. There are positives and negatives associated with this, but the main benefit is that people are held accountable for their own KPI data." ~ Mary Kay Gilbert, Vice President, Operations, Compbenefits, Inc. 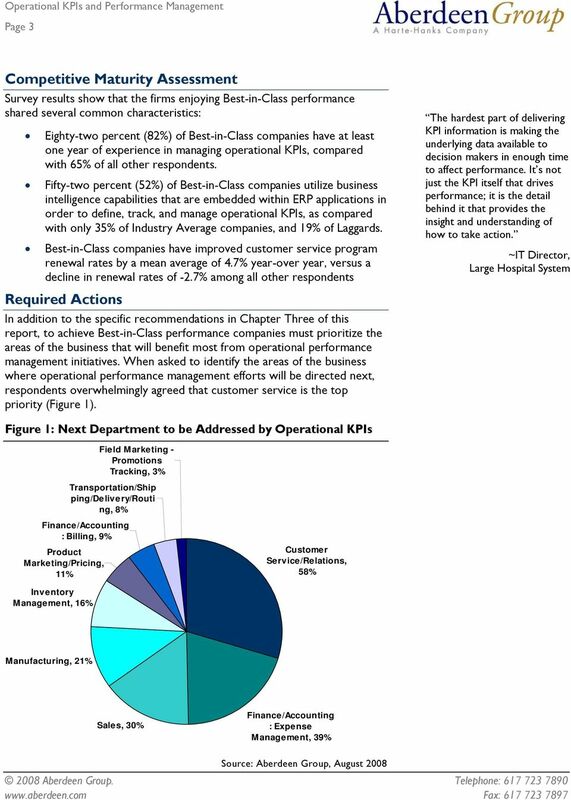 Figure 14: Best-in-Class Technology Management Capabilities 0% 10% 20% 30% 40% 50% Automate integration of operational data required to support KPIs 29% 45% Automated alerts based on change data (KPI thresholdsbased alerting) 17% 31% Best-in-Class All others The technology tools, services, and solutions that Best-in-Class companies are currently or planning to implement are listed in Figure 15.
Business Intelligence Deployment Strategies. Time and User Demand - the Drivers for "SaaS BI"
Business Intelligence in Healthcare. Have Providers Found a Cure?